One of the things I love going to Jones Hall to hear our wonderful Houston Symphony Orchestra is the prelude talks they give about 45 minutes prior to the concert. I have learned so much about classical music and the composers from those talks. For many years there would be different speakers who would give the prelude talks. But the last couple of years we have had one man who has given the talks, Maestro Carlos Andres Botero. Besides being an assistant conductor and consultant, Maestro Botero has been named the Houston Symphony Orchestra's "Musical Ambassador". What a wonderful choice HSO, as this friendly youthful gentleman always gives such informative talks about the conductors and the music we are about to hear in the concert, and he does so in an interesting and humorous way. Anyone coming to a Houston Symphony Orchestra concert who doesn't come early to hear Carlos' prelude talks is really missing out on a great experience. Also, what is great is after his prelude talks, he welcomes anyone who wishes to come up and ask him any questions they may have about classical music or the composers or the Houston Symphony Orchestra. 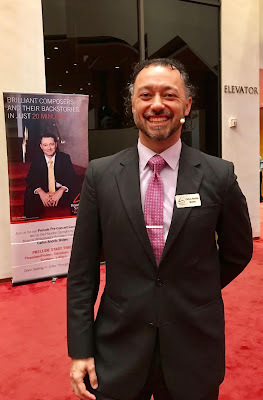 Here is how Mark C. Hanson [Executive Director, CEO of the HSO] puts it: "As Musical Ambassador, Carlos makes Houston Symphony performances more relevant and accessible to our current and future audiences throughout the community." Why I would love for everyone to come to Houston to experience one of Maestro Botero's prelude talks at Jones Hall, what is great is that Carlos has started his own podcasts at OurMusicPodcast.com. Now everyone around the nation can learn much about classical music from his podcasts. This is now season one of his podcasts on Our Music. From that site, Carlos says, "My life mission is to change lives of young artists and positively impact communities through the making of music." I hope all those who love classical music or those who are just getting into classical music or those who have no experience with classical music but would love to learn about it, will go to Carlos Andres Botero's podcasts at Our Music. Thank you!